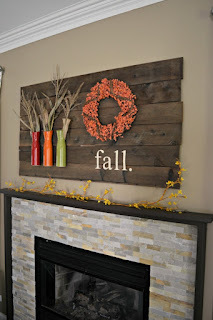 Look at all the Fall Feels going on with these cheap and easy decorating ideas! This project is so simple—it'll take you less than 10 minutes!—but it adds a big statement to your table. Use a variety of embroidery floss colors, like Inspired by Charm did, or adapt it to the theme or your home's decor. 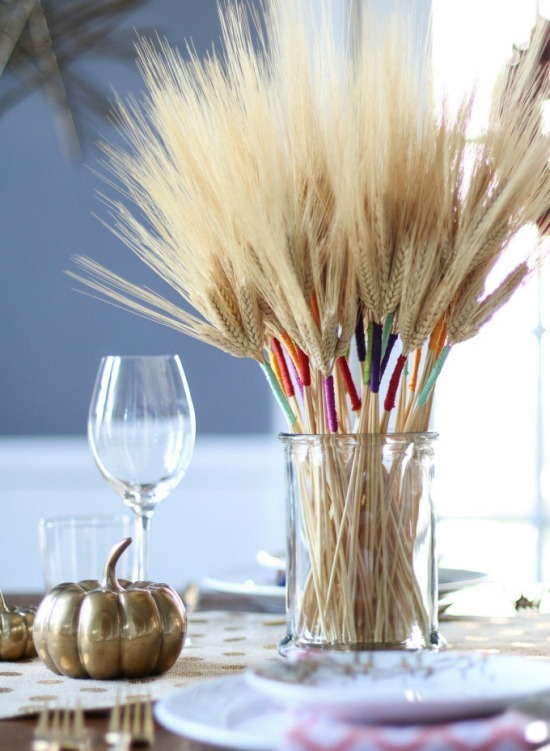 We love their idea of setting one wheat stalk at each place setting. Pumpkins are great for fall decor because they can stretch from Sepetember to Thanksgiving. 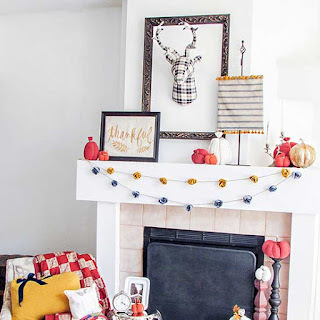 If you're looking to add more autumnal colors but don't want to buy new things, shop your house. No good finds? Make decorations like the fall rose garland from Pocket of Posies on this mantel. Who says fall has to be all about warm colors? 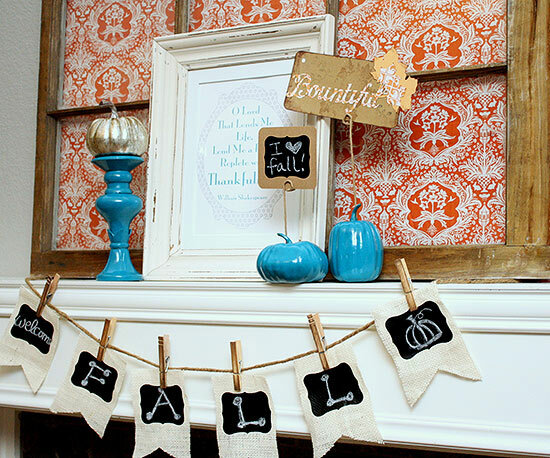 These white and gold pumpkins and touches of greenery add the perfect autumnal touch, along with the free fall printable banner from Just Destiny. The wood mantel provides the ideal amount of warmth in the all-white, paneled faux fireplace. 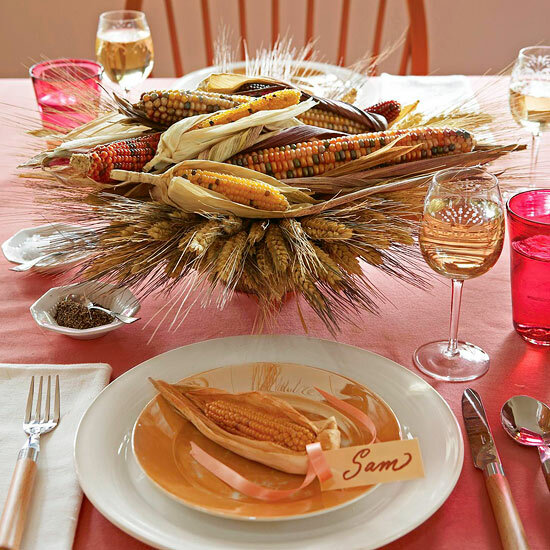 Nestle colorful ears of corn on a bed of wheat for a feast of earthy color and texture. Fit a shallow bowl with dry florist's foam, leaving the foam an inch or two taller than the bowl. Insert wheat stalks into the foam, parallel to the table top. Partially remove the husks from several ears of Indian corn and arrange them on top of the wheat. 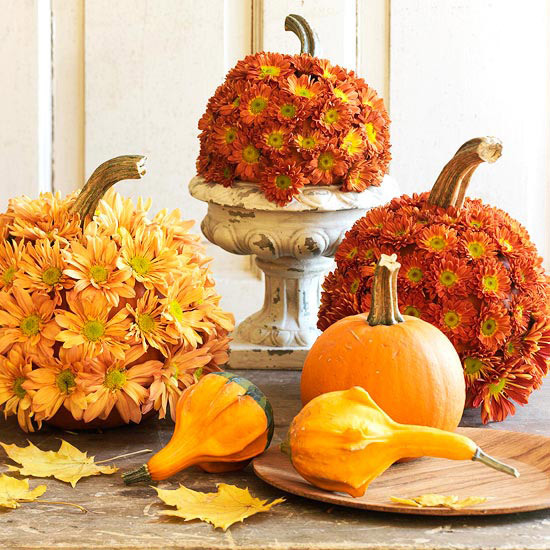 For pretty and quick fall centerpieces, create this beautiful autumn centerpiece with a small pumpkin, a grocery-store bouquet, and hot glue. Choose a bouquet of mums in harvest colors, and cut each flower just below the flower head. Attach each blossom to an uncut pumpkin with a dab of hot glue. 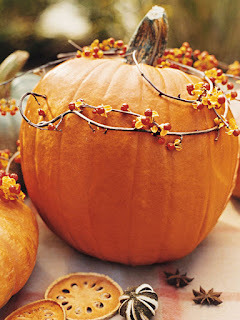 Sprinkle colorful leaves and small gourds around the pumpkins for added interest. This one is for the kids! 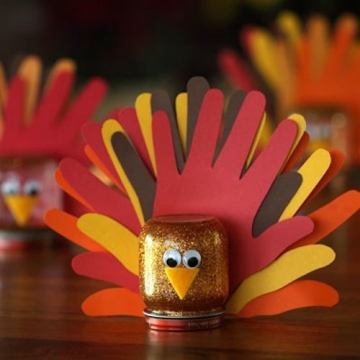 Younger children trace their hands on colored paper and help glue the turkey's nose and mouth. Older kiddos decorate the inside of a baby food jar with glitter paint. Turn these birds into place cards by having kids write guests' names on the feathers. This trendy monochromatic idea is perfect for transitioning from fall to winter. The layered mirrors add depth and dimension. 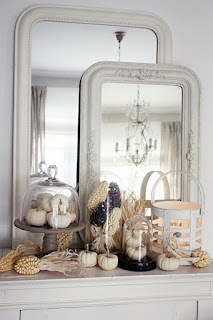 We love how Bianca (white-living.blogspot.nl) placed matching pumpkins on her end tables to tie the room together. 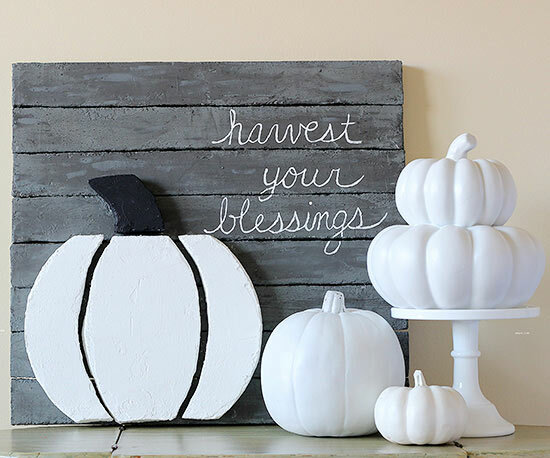 Swirl bittersweet vines around large pumpkins for instant and fresh fall centerpieces. Place the pumpkin on a platter so moisture won't ruin the tabletop, and complement the pumpkin with smaller natural elements, such as star anise, dried fruit slices, pinecones, or moss. 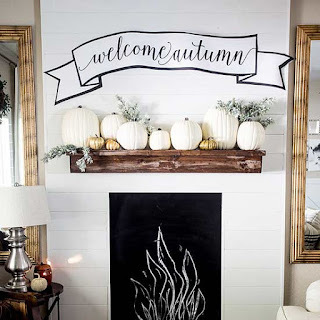 Decorating a mantel can be simple with a large, signature piece. Shannon (madiganmade.com) got extra crafty with her DIY mantel display by propping spray-painted pumpkins next to a (surprise!) plastic foam sign. The gray "boards" are painted and cut plastic foam sheets; the pumpkin on it is, too. Her pretty cursive is on display at the top, expressing her feelings for the season. Bold vases and a bright wreath jazzed up Abi's (laughingabi.com) plain DIY wood backdrop. 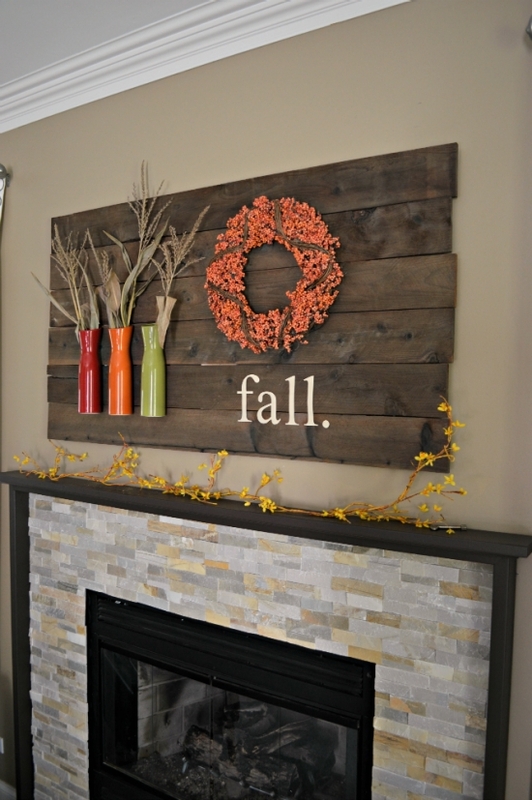 Change the colors to match your home, or use cool ones for a wintry look. You can even stencil and cut your own message from scrapbook paper.